For interiors that marry traditional and modern elements, the designer mixed new items with ones her clients already owned. For a local couple with a young child, the move to a Sudbury town house meant both more space and access to a good school system. Their new home’s open floor plan and back deck are perfect for frequent entertaining, and its lack of a yard suited them just fine. 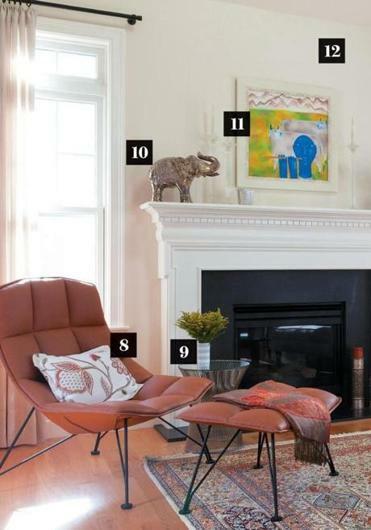 “With a busy schedule, the option of moving to a town house gave the appeal of less time needed in the yard and more time to spend with their 6-year-old daughter,” says Charlestown-based interior designer Jeanne Finnerty. She was hired pre-construction and designed the three-level home’s interiors, including the spacious living area where the owners welcome guests. 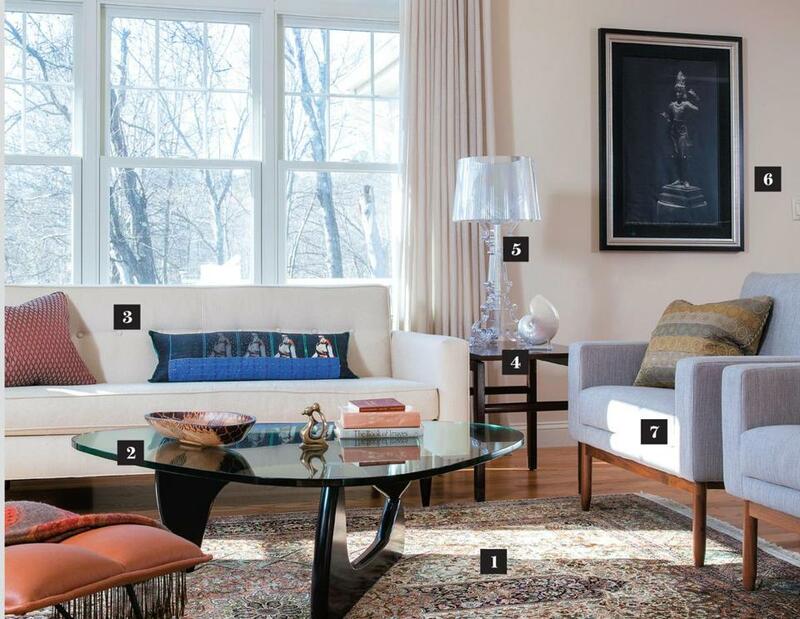 The family’s Indian heritage is reflected throughout the space — Finnerty mixed items her clients already owned with new ones, for interiors that marry traditional and modern elements from both Eastern and Western culture. 1. A patterned rug that the homeowner bought in Kashmir inspired the home’s color palette. 2. A graceful, glass-topped 1948 Noguchi table also maximizes views of the rug. 3. The trim sofa in pale textured fabric enhances the room’s mid-century feel. 4. The 1950s-era mahogany end tables by Edward Wormley have cantilevered tops and leather sabots. “The subtle details add interest to an otherwise simple form and are one of the homeowner’s favorite things from the project,” says Finnerty. 5. Bourgie table lamps from Kartell have a baroque base and pleated shade with a traditional feel, but are made of a modern material: transparent polycarbonate. 6. A dramatically framed art poster designed by the owner’s late uncle, a multimedia artist in India, has sentimental value. “I would not typically recommend a framed poster in a living room, but because it’s a demonstrative reminder of their family history, it works beautifully here,” says Finnerty. 7. The Danish-inspired “Raleigh” chairs from Design Within Reach are a perfect size to float between the breakfast area and the living room. Pillows are made from a delicate silk bought by the homeowner on a visit to India. 8. A modern Jehs + Laub leather chair in deep saffron pairs nicely with a custom pillow of embroidered fabric that has more traditional appeal. 9. Finnerty liked the small metal and glass side table, by Warren Platner for Knoll, for its textural and graceful base. The piece is sturdy and functional yet visually lightweight, she says. 10. A magnificent silver elephant is one of a pair that decorate the mantel — to some, including the homeowner’s mother, the animals are a symbol of luck. 11. A painting by Indian artist Haku Shah, bought at an auction in Mumbai, hangs over the mantel. Although relatively small, its bold imagery and saturated colors give the piece impact, Finnerty says. 12. All the walls on the first floor are painted Benjamin Moore Palace White, a counterpoint to the rainbow of colorful spaces on the second floor and lower level.